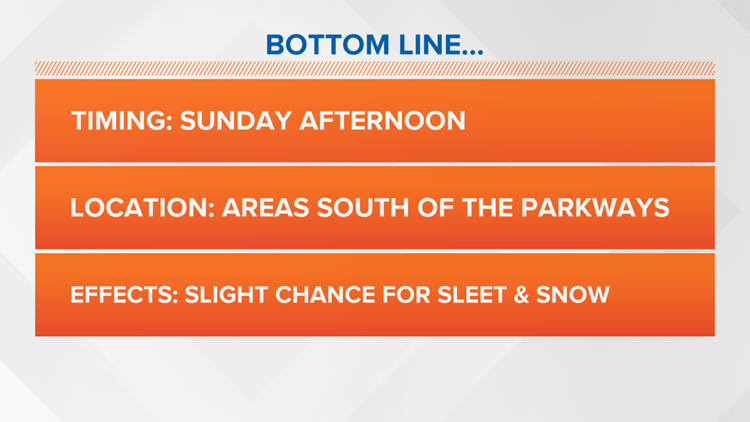 A powerful low pressure system moving across the south has the potential to provide a rain, sleet and snow mix off to our south over the weekend. We've been tracking this system for the past week and monitoring any model variations which would determine our precipitation type and intensity. As of the latest few model runs, the GFS, EURO and GEM models have begun to agree on a more southern and eastern path for this low pressure system. This trend would greatly effect our chances for wet weather on Sunday. An area of high pressure over eastern Canada may help to keep the system from moving farther north into the Ohio Valley. 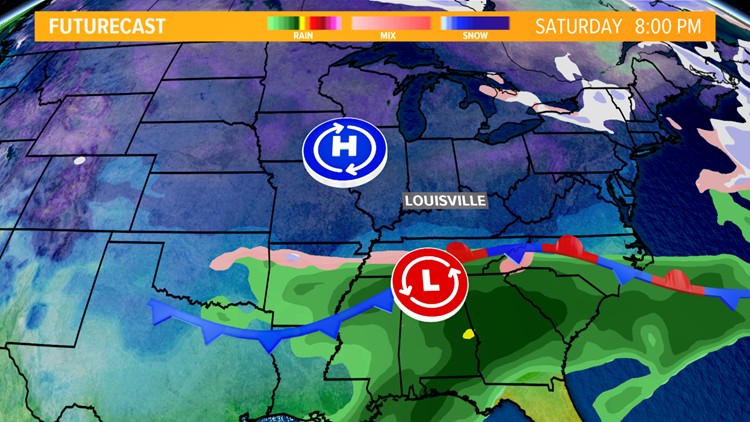 As of 9AM EST on Friday the system looks to stay off to the south of our Kentuckiana viewing area. The Lake Cumberland region may still see some small impact from this system, but for us, the weather is looking mostly dry. 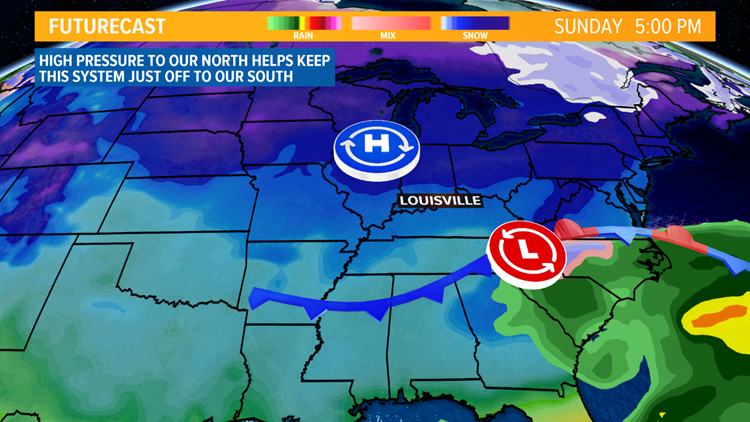 High pressure to our north will bring in a strong rush of dry air to Kentuckiana and that will aid in keeping the low pressure system off to our south and east as it progresses towards the eastern seaboard. 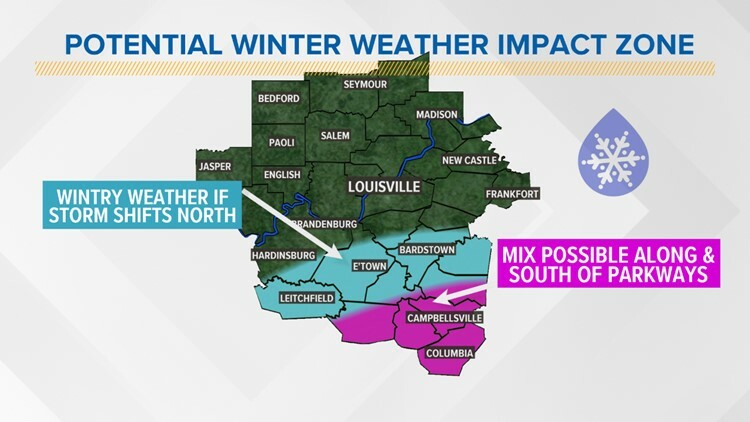 Both the EURO and GFS models now keep the all of the precipitation south of metro Louisville, but this could have a small impact to areas south of the Western Kentucky and Bluegrass Parkways. If the models continue to show the system staying south and east, we may have little to no impact here in Kentuckiana. Anyone traveling south and east of our Kentuckiana viewing area to Tennessee or Georgia would see more of an impact.